I’ve told y’all once before that I’m very specific about peanut butter pie. I’m a bit of a purist. My original recipe is a rich peanut butter pudding tucked into a graham cracker and toasted peanut crust, without cream cheese or chocolate. You can find my recipe here. However, it’s high time I posted the other peanut butter pie: the sinful version with both cream cheese and chocolate. I love baking special desserts to enjoy together after dinner, but lately, I love baking snack-type desserts that can be kept on-hand for whenever the mood strikes. Mr. Dessert For Two is always snooping through the fridge in search of a quick snack that he can grab before he runs off to another field to turn off the irrigation pump. It makes me happy to think of his eyes lighting up when he stumbles upon these. I hope it warms his heart that I baked these knowing that a chocolate-peanut butter craving would hit in the middle of a long, hard day. It’s one thing to do something for someone when they need it; it’s another thing to pre-empt their desires and be at the ready. If I’ve learned anything about blogging in the past year, it’s that bloggers are always ready to help, serve and love fellow bloggers in a time of need. Within hours of hearing that a fellow food blogger lost her husband unexpectedly, bloggers were uniting to form a support group. Please, take a little time to imagine what it’s like to be in someone else’s shoes (it makes us better people after all), and click on over to pour your love and support for Jennifer’s family. Jennie requested that we bake peanut butter pies (her husband’s favorite) for those we love and share them today. 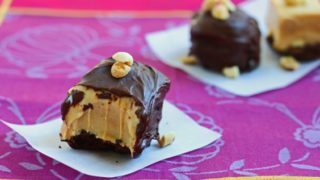 Nothin’ goes better with peanut butter pie bites than sticky peanut butter kisses, so give a big hug and kiss to everyone you love today. Please keep Jennie’s family in your thoughts and prayers. Butter a 9" x 5" x 3" loaf pan. Mix the crushed chocolate cookies and melted butter together in a small bowl. Press the crumbs into the loaf pan. Pour the melted chocolate chips on top and smooth with an offset spatula. Sprinkle the toasted peanuts on top, then place the loaf pan in the fridge to set while you continue with the recipe. In a small bowl beat the heavy cream until stiff peaks form. Set in the fridge. In another bowl, beat together the cream cheese and peanut butter until smooth. Add the powdered sugar and continue beating, then stream in the condensed milk, vanilla and lemon juice. Once the mixture is well-combined, add 1/3 of the whipped cream mixture and stir to combine. Then, gently fold in the remaining whipped cream, being careful not to deflate it too much. Pour the mixture over the crust and set in the fridge to chill. Slice into squares for serving. To coat in chocolate, place the pie squares in the freezer to firm up for about an hour. In the microwave or double boiler, melt the chocolate over low heat while stirring frequently. After the pie squares have hardened slightly, dip the top of the squares in the the chocolate, letting the extra chocolate drip down the sides. Store in the fridge. I love it! Peanut butter and chocolate are my favorite combo! OMG my mouth is watering right now! These look so delicious!! Oh bless you! Once again my waist band is stretching just thinking about this. These look fantastic. I love all the varieties of peanut butter pit coming out today for Jennie. What a nice way to support a friend. I seen great peanut butter pies today. I love your presentation. so sweet of you to particiate! I wish I had as much influence to convince peole to eat chocolate in memory of my mom. then again, ‘chocolate’ doesn’t need an excuse. but my mom loved nothing more than that! 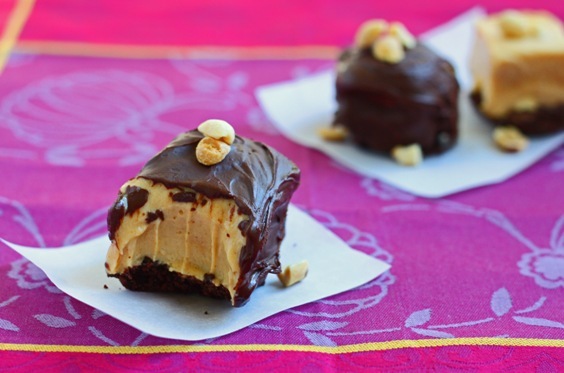 …a great take on peanut butter pie. I love that each pie is individual …but the sentiments of each blogger is lovingly the same. The bites are so cute! Glad you were able to make a version of Jennie’s pie! Peanut Butter and chocolate is probably my all time favorite combination. How sweet! The support from the blogging community has been amazing,a wonderful tribute. thank you for sharing. Oh my – these beauties would do my Nana proud! They look so moist and chewy. You definitely have the southerner in me going! I’m definitely going to make these the next time all of the kids visit. And thanks so much for stopping by our little blog. Cheers! OMGosh girl! I need these in my life! YUM! such a wonderful tribute! these bites are so cute!! Thank god bikini season is ending… These look phenomenal! I’m fainting from love. Yup. OH MY! These look amazing, my hubby would go nuts for them! What a great recipe, I made these last night and they came out great. The only tricky part was getting them out of the pan. They came out a bit messy, but that was remedied when I dipped them in chocolate!